You want a keyboard case for your iPad because sometimes you need physical keys for an extended typing session. The problem is that most keyboard cases add lots of bulk to your sleek Apple tablet. Belkin solves that problem with the YourType Folio and Keyboard ($100 as of May 11, 2012), which makes the keyboard portion removable. On its own, the case adds no more bulk than the average folio-style case, although that slim fit makes getting the third-generation iPad in and out difficult. The case has no specific grooves for slotting the iPad in when it's propped open, so the viewing angle is wherever you want it to be. I also found the setup to be stable enough on my lap. The Bluetooth keyboard attaches to the case with four Velcro strips--one on each corner. The keyboard itself manages to be relatively slim without sacrificing typing comfort too much. The removable keyboard provides lots of flexibility. Another advantage to the removable keyboard is that you can position it anywhere you wish, so you don't have to leave it directly in front of the iPad. 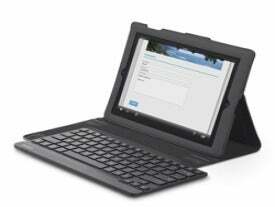 You can bring the keyboard closer without needing to drag the whole case and iPad toward you. One of the most comfortable positions I found for the keyboard was having just its back edge up on the case and its front down on the table, giving the otherwise flat keyboard a better angle for typing. A small lip at the front edge houses the on/off switch. On the left side of the lip is a Micro-USB port for charging, as well as a small blue LED that blinks when the keyboard is in pairing mode. Putting the keyboard into pairing mode was very easy, as the keyboard has an actual key for the task, not a tiny, recessed button on the back or the bottom that you must press with a pin. In fact, this keyboard offers several handy keys that are specific to use with an iPad. Since you don't need Ctrl and Alt on a regular basis when you're working on an iPad, those keys on the right side have been replaced with ".com" and "@." Now those are some useful keys. The top row consists of iPad-specific function keys, including lock, home, a key to toggle the on-screen keyboard, search, copy, cut, paste, media playback, and volume control. Fitting a full set of keys within the width of the iPad results in smaller-than-average keys. The island-style layout feels a little cramped, but the feedback and key travel are both great. Once I adjusted to the closer layout, I found typing on this keyboard to be comfortable even for longer sessions. The only real disappointment is the large amount of flex in the center of the keyboard. It doesn't cause any issues during typing, but that amount of flex can be disconcerting when you're detaching the keyboard from the case. Overall, the keyboard is great to type on, and the case doesn't add too much bulk to the iPad, making the Belkin YourType Folio and Keyboard a great choice for traveling. The option to remove the keyboard and leave it behind means you don't need to use a separate case when you want to save space.